Webcam image of the nesting ospreys at Thatchbed Island. ESSEX — The Essex Land Trust’s Thatchbed Island property is once again hosting returning Ospreys. Having wintered in the warmer climates of Central and South America, the arrival of Ospreys towards the end of March is the clearest indication that Spring is on its way. 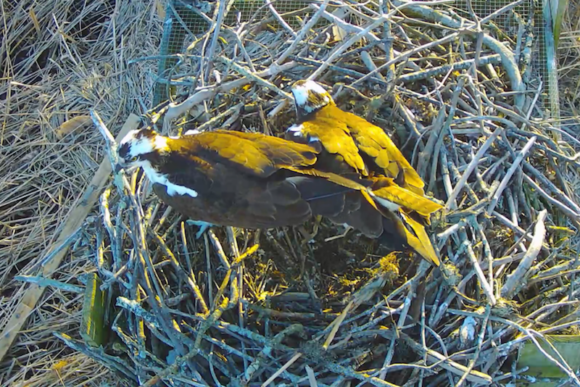 The Essex Land Trust’s OspreyCam has not been operational for the past two seasons due to battery and camera problems. With these problems now resolved, the Trust took advantage of the opportunity to upgrade the camera to digital quality. This Thatchbed Platform has been hosting a nesting pair since 2003 and has successfully reared numerous fledglings. I see you! 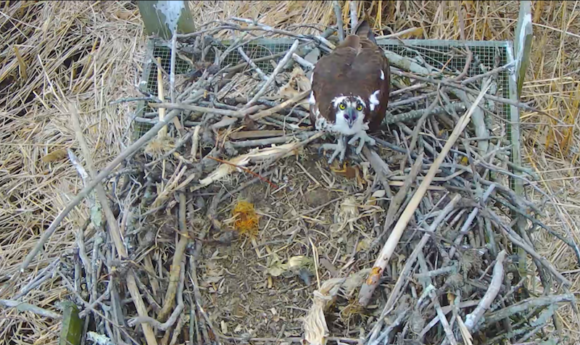 A osprey looks up at the camera from his — or is it her –nest? Ospreys continue to make a remarkable comeback after having practically disappeared from our coastal region in the 1970s and 1980s. In 2017, the Connecticut Audubon Society’s Osprey Nation Citizen Science Program monitored 540 nest sites throughout the state. Of these sites, there were 394 active nests and 607 total fledglings observed in the state. Ospreys are now occupying new nesting sites that are further inland than their historical range along the Connecticut coast. The Middlesex County Community Foundation/Riverview Cemetery generously funded the initial installation of the Essex Land Trust OspreyCam. The live streaming of the Essex Land Trust OspreyCam is made possible by the generous support of Essex Savings Bank.